Additional Info: Piano teacher & professional pianist. Studied music at Leeds College of Music gaining BTECH Dip. CLCM Diploma/concert standard on piano, taught by Denis Matthews (1980). Involved in ABRSM accompaniments and previously accomp. for Whitby Choral Society, and Bradford Arts Soc. (Music & Drama) - provided & transcribed music for various musicals inc. Wizard of Oz, Bugsy Malone & play well known classics. 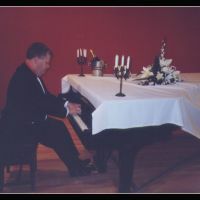 Play piano for weddings, banquets & special occasions.